Despite being the largest producer of food grains, India is yet to bridge the gap between food security and farm income. The ambitious dream of incumbent Government to double farmers’ income is encumbered with contemporary challenges like climate change, resource scarcity, and overcrowding population. Technology is the only way out here. Fortunately, the India-Israel Cooperation in the field of agriculture is a significant opportunity for drifting towards technology-driven agriculture. The recent visit (Jan 2018) of Israel Prime Minister Benjamin Netanyahu to India was also a spearhead in twenty-five years of bilateral relations in Agriculture. This dates back to 2006 when Agreement on Agriculture cooperation was signed between the two nations to utilize Israel’s exceptional expertise in Agriculture, where 60 percent area remains a desert. This later evolved into Indo-Israel Agriculture Project (IIAP) implemented by Israel’s Mission for Integrated Development of Horticulture and MASHAV, Israel’s Agency for International Development under its Ministry of Foreign Affairs. Consequently, Israel shares its best practices through capacity building and professional training programme piloted both in Israel and India. The significant goals of the production, and resource use efficiency. To achieve these goals, it was decided to set up “Agriculture Centers of Excellence” (CoE) funded by the Central Government and respective State Governments by allocating land and professional manpower. Thus, India contributes the essential physical infrastructure and Israel backs the innovation. “We exchanged views on scaling up the Centers of Excellence that have been a mainstay of Agricultural cooperation by bringing in advanced Israeli practices and Technology,” said PM Narendra Modi in a press statement during the recent visit of Israel PM Netanyahu. As many as 28 Centers of Excellence are expected to be set up under the programme. One new center at Bhuj, Gujarat was inaugurated jointly by them during their joint visit to Gujarat. They also visited Vadrad based CoE for Vegetables, that spans over a 10 h.a. in area with a high-tech nursery in which vegetables can be grown in all three seasons with minimal use of water. Another CoE in Kutch, exclusively dedicated to fresh dates was inaugurated through remote control facility. Moreover, the CoE for Beekeeping and for Diary in Haryana is in the pipeline. Over the years, these CoEs have delivered a platform of rapid transfer of technology to the farmers. Protected cultivation, drip irrigation, and fertigation, canopy management, nursery production, Integrated Pest Management are commonly demonstrated at these centers and are increasingly adopted by farmers to increase their yield and income. PM Netanyahu opined that “Some plants need more water, some less. We can see it today with big data, with drones, with other instruments of technology to make farmers produce much more crops. More crops with less.” underlining the need of water use efficiency in Indian Agricultural practices. 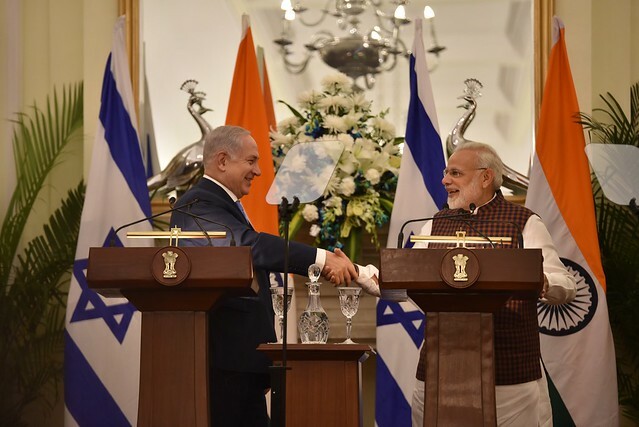 Further, in a Joint statement issued after the meeting, India and Israel announced that “Both sides are working together on a five-year joint work plan for strategic cooperation in Agriculture and Water.” This doesn’t stop here, the New Action Plan drafted after PM Modi’s visit to Israel in July last year envisages the joint development of new crop varieties and sharing of post-harvest technologies. Israel being a start-up capital of the world, Innovation and entrepreneurship at various stages of Agri value chain have been a key to successful Post harvest management. This can be infused into our Start-up India program with their assistance. Similarly many Israeli Kibbutzim community jointly developed food processing industries that address output fluctuations in market. Indian Government recent push to cluster based Agri development could be learned from that. These initiatives if done would increase employment to educated youths and also to retain youths in Agriculture. Thus, new gesture of visit by Israel PM and our robust bilateral partnership will certainly invigorate the future of Agricultural Cooperation. Eventually, the visit itself coincided with harvest festivals of Makar Sankranti, Pongal, Lohri and Bihu which provides a new hope for the Agrarian communities. Let us hope for a progressive and technology-driven evolution in Indian Agriculture.